Proprietor brothers Adam and Andrew Mariani acquired 256 acres which included a waning turkey farm in 2007 three miles east of the Sonoma Town Square in Carneros that has a long and colorful history. Scribe's neighbor is Gundlach Bundschu. The site dates to 1858 when Emil Dresel and his brother Julius established the wine property. They may have planted the first Riesling and Silvaner vines in the United States. The Mariani brothers grew up in Winters farming walnuts and almonds, and enjoyed it enough that they longed for a life in agriculture. After working at wineries in Europe, they found an estate of their own in Carneros. Along with partners Kristof Anderson and Andrew Avellar, the trio is revitalizing the property and growing 35 acres of Pinot Noir, Chardonnay, Riesling and Sylvaner with the first plantings going in the ground in 2008. Initially, as the young vines matured, the wines were crafted from purchased grapes from Carneros and leased vineyard property in Napa. The first estate vine came in 2011. A winery is planned that will be built to preserve the turkey shed imprint and honor the history of the property. A 100+-year-old hacienda on the property awaits renovation. 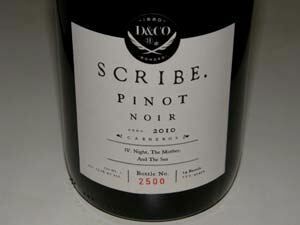 The 2007-2010 Scribe Carneros Pinot Noir consists of 125 cases priced at $42. 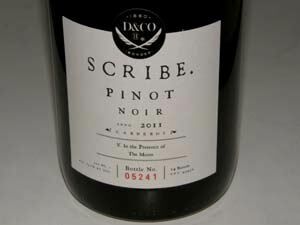 A recent write up in Food & Wine Magazine indicates that membership in the Scribe Viticultural Society is worth considering not only for the wine but to gain access to events at the Scribe Estate. Mariani has a group of Bay Area chefs as pals including Alice Waters (Mariana dated her daughter) and any number of them may show up at the wine estate holding forth at an outdoor kitchen and wood-fired oven. Tastings by appointment only, 2300 Napa Rd. in Sonoma (707-939-1858).